Posted by FTR ⋅ July 26, 2005Post a comment Email This Post Print This Post Tweet This! 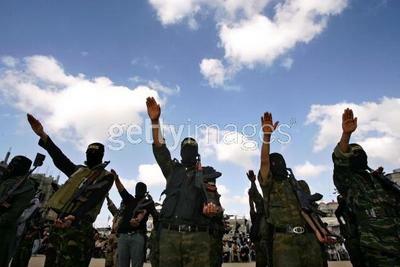 Palestinian Islamic Jihad rally, 4/15/2005. PIJ is an offshoot of the Muslim Brotherhood. Do the participants in this rally appear to be making an Islamic gesture? In the wake of 9/11, the London bombings and other, less-publicized terrorist incidents, this program sets forth more information about the historical development of the fascist/Islamist relationship. (FTR#456 is a compendium of many of the fascist/Nazi links to contemporary terrorism—9/11 in particular.) After highlighting a number of articles relevant to 9/11 and fascist connections to that incident, the broadcast presents an informative paper detailing the development of the Third Reich’s relationship with the Grand Mufti of Jerusalem—an SS officer, key Axis spy and (eventually) the first leader of the Palestinian national movement. Husseini was an officer in the Turkish army in World War I, during the period in which the Turks committed genocide against the Christian Armenians. After the British assumed control of much of the Arab territory formerly held as part of the Ottoman Empire, they groomed al-Husseini as a primary functionary of theirs in the Middle East. A murderous anti-Semite, al-Husseini eventually became the Grand Mufti of Jerusalem—the leading Muslim cleric in the British protectorate of Palestine. It is noteworthy that the British reversed their 1922 agreement to abide by a League of Nations mandate to provide for a Jewish homeland in Palestine, in order to curry favor with the Arabs. (Of course, the Arabs controlled the vital oil resources of the Middle East and, because of that, were deemed more important for British imperial aspirations in that part of the world. Program Highlights Include: Yeslam Binladin’s offer to pay for his brother’s legal defense in the event of Osama’s capture; a statement by the father of 9/11 hijacker Mohamed Atta supporting the London transit bombings; the fact that Atta’s father bears the same name as a key al-Qaeda weapons procurer (who’s brother financed al-Qaeda and was represented by Homeland Security chief Michael Chertoff); the conversion of British fascist David Myatt to Islam; Myatt’s association with the Islamofascist imam of the Finsbury Park mosque; the League of Nations’ 1922 endorsement of the concept of a Jewish homeland; the Grand Mufti’s illegal elevation by the British to his position of power between the wars; the Grand Mufti’s initiation of pogroms against the Jews between the World Wars; the Grand Mufti’s eventual alignment with Nazi Germany during World War II; the World War II era Arabs’ saying “In Heaven Allah, on earth, Hitler.” For more about the genesis of the fascist/Islamist axis, see—among other programs—FTR#’s 371, 383, 414, 416, 453, 473, 514. 17. The Grand Mufti’s hatred of Jews (and subsequent alliance with the Third Reich) was matched by that of Muslim Brotherhood founder Hassan al-Banna. (For more about the Muslim Brotherhood, see—among other programs—FTR#’s 343, 455, 456, 473, 513, 514, 518. Use the search function linked at the top of this description to find more information about the Muslim Brotherhood.) “Mufti hated Jews for the same reasons as Hasan al-Banna in Egypt. Jews, especially the arriving Zionist immigrants, brought a modem, Western/European way of life, a direct opposite of what the fundamentalists wanted. Just as Banna, Husseini felt personally threatened by Western culture. ‘The Jews have changed the life of Palestine in such a way that it must inevitably lead to the destruction of our race …. The Jewish girls who run around in shorts demoralize our youth by their mere presence.?? 45. For a visual perspective on the fascist/Islamist connection, check out the photograph above. It is a picture of a Palestinian Islamic Jihad rally on 4/15/2005. PIJ is an offshoot of the Muslim Brotherhood—a link discussed in, among other programs, FTR#’s 473, 514. Do the participants in this rally appear to be making an Islamic gesture? !